Fancy the most affordable Range Rover there is? Another Prince in Land Rover’s own Royal Family, the Land Rover Range Rover Evoque Hatchback sits below the standard Range Rover in the pecking order. It’s super stylish, comfortable, and a very assured choice in this sector. The Evoque is one of the smallest models the British brand offer. Indeed, upon its releas, it inspired a whole host of rivals to produce their own small SUVs. However, getting Victoria Beckham on board to help with the interior design caused some motor journalists and potential buyers to wonder if Land Rover are guilty of putting style over substance this time around. OSV finds out with our 2017 Land Rover Range Rover Evoque Hatchback review. One thing that hasn’t changed since the addition of a Spice Girl to the team is the Evoque’s drivability. It’s still as much fun as ever and beats its rivals hands down in this area. It’s arguably one of Land Rover’s most drivable models too, helped by the fact that it’s relatively compact. On the road, it feels like a regular hatchback most of the time. That said, we recommend that you add the Adaptive Dynamics system if you truly want to get the best out of it. It’s a smart piece of tech that shores up it composure. In terms of its engines, the entry level 2.0-litre TD4 diesel engine is not a bad choice. It develops 148bhp, and takes 10.6 seconds to complete the 0-62 sprint. That’s not especially fast, but it is quicker than the dated 2.2-litre engine it replaces. It’s more efficient, more refined, and quieter, too. However, we think most buyers will be more interested in the 178bhp variant of the same engine. That extra 30bhp helps it launch you from rest to 62mph in 8.5 seconds. It comes at a slight extra fuel cost, though. There is also the option of a turbocharged 2.0-litre Si4 petrol engine. But despite doing 0-62mph in an impressive 7.6 seconds, it’s too expensive to run for us to recommend with eagerness. Moreover, it’s not available on all the models. The Evoque Convertible can be paired up with it. But this is also a model hard to recommend unless you really want a drop-top SUV. It’s hard to recommend because the roof weighs 277kg, with that extra weight punishing the drivability of the car. It might only be a Prince in awe of a King, but the smaller Evoque gets just as much luxury as the standard, much larger Range Rover. Sure, it’s the most affordable in the Range Rover stable, but it feels anything but cheap. Leather and metal are used liberally in the cabin, creating an upmarket environment that’s a pleasure to be in. Fit and finish are excellent. It’s easy to get comfortable in the driver’s seat, thanks to lots of adjustability, and a touchscreen infotainment system is standard on all models. This is a classy system that lets you focus on the sat nav while your passenger enjoys a movie. The dash itself is home to some neat, 21st-century controls, including the automatic gearboxes rotary dial that are forged from metal. There are a few issues with practicality, but they’re really only minor. For example, the small rear windscreen makes it a pain to reverse. Still, Land Rover have remedied this issue slightly by adding rear and front parking sensors to all models. Of course, the Evoque can contend with its siblings on the practicality front, as it’s just not as big. But it has worth off-road abilities, a roomy interior, and well-shaped 575-litre boot. That’s competitive for this class, but the figure is a bit deceptive: It’s only 575-litres if you fill it up to the roof with luggage. If you cut it off at the rear parcel shelf, it actually measures just 420-litres. Still, the load area is a good shape, and the rear seats can be folded almost flat. When you do fold them, you get 1,445-litres of space in the five-door model, and 1,350-litres of space in the three-door. Standard kit is pleasing across the range. The entry-level model gets a leather steering wheel, 18” alloys, an 8-speaker stereo, cruise control, and a DAB radio. It also gets all-round parking sensors, sat nav, 12-way adjustable seats, and front fog lights. The HSE Dynamic takes things up a notch with 20” alloys, and better rear and front bumpers. It adds an enhanced stereo, enhanced sat nav, and a 10.2” InControl TouchPro infotainment screen. The HSE Dynamic Lux model doesn’t change anything aesthetically, but adds a panoramic sunroof, an automated parking system, and a surround view camera. The Autobiography model completes the range with a full leather interior, unique 20” alloys, and 14-way adjustable seats. Safety is fantastic, with the Evoque scoring all 5 stars when Euro NCAP crash tested it. Its standard safety kit includes lots of airbag’s, seat belt pre-tensioners, and electronic stability control. Safety options include a lane-keeping assistance system, and a road-sign camera. Prices for the new car start out from £30,750 and rise to £48,900. For more information on our leasing deals, check out our page here. In terms of its running costs, the Evoque is the most frugal out of all the Land Rover’s. In two-wheel-drive guise with the 2.0-litre 150bhp engine, it can return as much as 67.3mpg. However, two-wheel-drive means it’s not as capable off-road. It also means you only have three doors. The bigger, four-wheel-drive 2.0-litre 180bhp diesel engine returns 58.9mpg, which is still very good. The 2.0-litre 240bhp petrol engine, meanwhile, is less of a wise choice if running costs matter to you. It returns 36.2mpg. and emits 181g/km of CO2. This is Land Rover’s biggest success story ever. Judging it on its looks alone, it isn’t hard to see why. The cheapest diesel returns around 67.3mpg. That beats its rivals – as we’ll see below – hands down. As long as you avoid the cheaper two-door-model, you’ll have a tough and highly capable off-roader on your hands. It’s not a small car by any stretch of the imagination. But the three-door model in particular makes accessing it tricky, while the cabin is on the cramped side compared to rivals. Evoque’s used to be saddled with Land Rover’s archaic infotainment system. That’s no longer the case, but the sat nav still isn’t as complete as upmarket competitors. 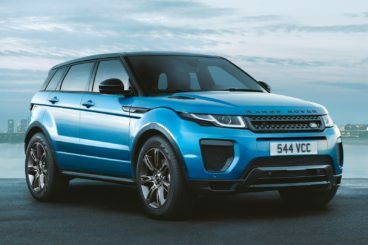 Let’s see how the car measures up against its rivals in the comparison section of our Land Rover Range Rover Evoque Hatchback review. The new Jaguar F-Pace Petrol is handsome, smooth, luxurious and practical. It’s a strong contender in this class. It’s a fantastic car to drive too, with its driving experience involving and rewarding you. It’s accurate steering gives you plenty of confidence, while the improved suspension setup ensures it protects you much more from bumps and lumps. Opt for the 22” alloys, though, and the ride will be a bit more uncomfortable. Body lean in bends is well managed, and for most of the time you’ll even forget you’re driving such a big car. The automatic transmission is better suited to the F-Pace than the manual. But specifying it means you’ll have to spend more on the four-wheel-drive system. Off-road, it’s not quite as polished as the Land Rover, but it’s still very capable. A few gadgets help to this end, including a Drive Control system that lets you flick between Snow, Ice and Rain settings. In terms of the engines, the 247bhp petrol unit is hard to recommend. It does 0-62 in 6.8 seconds and returns less than 40mpg. This means it’s less economical than the diesel models, and hardly any more performative. That said, it’s near-silent. If you just want pure power and pace, the F-Pace S model is the go-to option. Backed by a supercharged 3.0-litre petrol engine, it performs like a sports car and costs pretty much the same to run. Returns of 31.7mpg aren’t exactly attractive, and they’ll also be hard to achieve in the real world. You’ve been warned. Inside, the F-Pace boasts the kind of top quality interior that we expect from a Jaguar. Leather comes as standard, as does the brand’s InControl infotainment system. This is the best of its kind in this class, and a huge improvement over the last model. It’s intuitive and simple to use, and is compatible with Apple CarPlay. And despite how stylish the car is on the outside, it’s super practical inside. Accessing the car is easy thanks to the doors that open wide, and head and legroom are excellent. Adding the panoramic sunroof will take away some of that headroom, but not a huge amount. Overall, there is a great impression of airiness in the cabin. The boot measures 650-litres, which is significantly bigger than the Evoque. Drop the rear seats, and you can increase it to 1,740-litres. On tarmac, the new Porsche Macan Petrol is better to drive than the Evoque. But how is it off-road? Not too shabby at all! Thanks to a sturdy four-wheel-drive system and a robust chassis, the Macan is highly capable when roughing it. It’s not quite in the same league as the Evoque, but it will hardly let you down. On tarmac, it holds the road well and doesn’t feel like a hulking SUV most of the time. Its suspension setup ensures good ride quality, and there is also praise for its minimum body lean and nicely weighted steering. 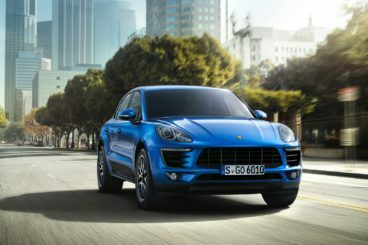 In terms of its engines, the Macan Turbo model is exciting. It’s powered by a turbocharged 3.6-litre petrol engine that does 0-62 in a swift 4.8 seconds. Its handling is sharp as a razor thanks to the brand’s PASM suspension system, and it maxes out at 165mph. Add the Performance Package and you can increase its power to 434bhp, while boosting its 0-62 time to 4.4 seconds. You can add the same package to the Macan GTS model. Doing so means its twin-turbo 3.0-litre V6 engine develops 355bhp, and does 0-62 in 5.2 seconds. The 2.0-litre petrol engine is the most “sensible” choice. It’s the entry-level model, and can do 0-62 in less than 7.0 seconds. That will probably be enough for most buyers. However, it’s hard to recommend. It’s not as powerful as the other petrol models, and it’s less powerful and less efficient than the Macan diesels. The GTS is the best choice for enthusiasts. As well as packing lots of power, it averages 32.1mpg economy, which isn’t awful. It also emits 207g/km of CO2. 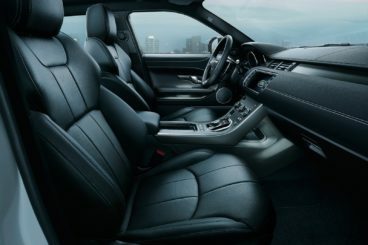 Inside, the Macan houses a quiet and spacious cabin. Even at speed, you’ll barely hear a peep or a groan from the engine. The dashboard is both robust and sporty, and should be able to deal with everything family life throws at it. We like the smart-looking clock that sits above the air vents and sat nav. Buttons on each side of the transmission are another neat touch. There is enough room for five people to get comfortable, with sufficient head and legroom. The driver naturally has the best seat, with the seat offering a commanding view of the road. Lots of cubby holes are dotted around the cabin to help you keep things clean and tidy, with all four doors getting a bin. The boot measures 500-litres, which is reasonable, if smaller than the Evoque. Fold the rear seats and you can extend it to 1,500-litres. It’s Land Rover’s smallest offering, their most affordable, and their most successful. That’s hardly a surprise, as this is a very complete SUV. It has go-anywhere off-road ability, two-wheel-drive efficiency if you need to keep the costs down, and looks fantastic. It’s tech has been updated, and it remains good to drive on tarmac. In 2017, if you still don’t know what the big deal is with a Land Rover Range Rover Evoque Hatchback, now might be the time to find out.